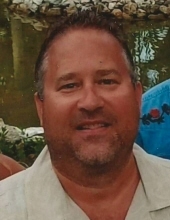 Jeffrey John Achinger, age 51, of Holland, OH passed away unexpectedly on February 2, 2019 in Antrim County Michigan. He was born April 23, 1967 at Riverside Hospital in Toledo to John and Elizabeth (Heller) Achinger. Jeff was born and raised in Toledo's Point Place Community and was a graduate of Woodward High School. He received a Bachelors degree from the University of Toledo in Electrical Engineering and was employed as a sales representative for ON Semiconductor for more than 20 years. He enjoyed boating and was a member of the Ottawa River Yacht Club. Jeff was a travel enthusiast, often traveling internationally for both business and pleasure. Camping was one of his favorite pastimes, especially sitting around the campfire in the evenings with his family and friends enjoying a beer. We hope that he is now sitting in heaven with Mom enjoying a cocktail. Jeff is survived by his wife, Kristie; children, Danielle, Chelsea (Mike), Josh, Taylor (Jim), Noah, Sophie, Kyle (Lauren), Connor and Meagan; father, John; siblings, Buzz (Kim) Achinger, Tammy (Scott) Martin and Nicky (Dennis) Murphy; in-laws, Mike and Patty Schaub; brother-in-law, Sean (Mayra); many aunts, uncles, nieces and nephews; dogs, "Lefty" and "Ally"; grand-dogs, "Teddy" and "Chuck"; and snake, "Mr. Cuddles". He was preceded in death by his mother, Elizabeth; and grandparents, Warren and Martha Heller and William and Marion Achinger. Family and friends may visit Thursday, February 7 from 3-8 pm at David R. Jasin-Hoening Funeral Home, 5300 N. Summit St. Toledo, Ohio. The Funeral Service for Jeff will begin Friday, February 8 at 12:00 pm in the funeral home. Memorial donations may be given to the Toledo Area Humane Society. To send flowers or a remembrance gift to the family of Jeffrey John Achinger, please visit our Tribute Store. "Email Address" would like to share the life celebration of Jeffrey John Achinger. Click on the "link" to go to share a favorite memory or leave a condolence message for the family.